Imagine that! It’s actually much easier than you think to train your chickens to feed themselves, all you need is the right kind of chicken feeder ,a peg and a little motivation…food! In this article we will be looking at how you can easily train your Chickens to use an Automatic Treadle feeder. When a hen steps onto an Automatic chicken feeders trigger ledge (also called the treadle), the lid opens allowing the Chooks access to their feed. These types of feeder area ideal for use both for free range hens and those in a Coop. Keeps feed clean- by preventing access to pests and rodents you won’t find any nasty surprises in the feed. The Somerzby Automatic Chicken Feeder has all the above benefits plus the added bonus of being Safe for your chickens. The lightweight lid closes slowly and will not harm your chooks. Made from long lasting aluminium, our feeders are built to last and can’t rust. Click here for more information on our Automatic Chicken feeder supplies. Whilst each chicken has it’s own personality and traits, generally Chickens are inquisitive and intelligent animals. They can complete complex tasks and learn through watching each other.. all of which is great news when it comes to training them. Realistic expectations– It normally takes a couple of weeks for the chickens to get used to the feeders. You may need some persistence and patience, however it will pay off in the long run! A Clothes peg -To prop the feeder lid open while your chooks are getting used to their new feeder., this teaches the Chickens there is feed inside. Flat, Even Ground – The feeder works best on flat, even ground. 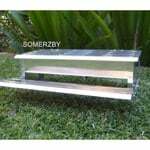 The Somerzby Automatic feeder is supplied with a wire peg to secure the feeder if the ground is slightly uneven. Start off using a clothes peg at the rear of one of the sides. Prop the lid completely open so that the foot plate is right down on the ground. This will train the chickens that there is food inside and get them used to the feeder. After a week or so, move the clothes peg to the front of the feeder. The foot plate will now be halfway down, which helps the chickens get used to the movement of the foot plate while they can still see the food. After another week or so when the chooks seem to be used to the idea, remove the peg completely and place a small amount of feed around the feeder and on top of the feeder to attract the chickens. As the Chickens approach the feeder to eat the food on top, some will hopefully step on the foot plate which opens the lid. And that’s it! Once one chicken has learned how to use the feeder, the rest will learn from them. 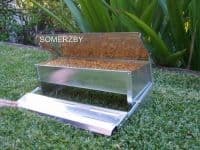 The Somerzby Aluminium Self Treadle Feeder comes with a 100% Satisfaction Money back guarantee and a 12 month Warranty, click here to buy one now. This entry was posted in Chickens and tagged chickens, chook, feed, feeder, feeding, train, training.